Our feelings about food and our attitude towards it are changing. Before long it won’t just be considered sensible to care about how and what we cook and how much we waste – it will be unacceptable not to. But Food From Plenty is not another tome bemoaning global warming and dwindling fish stocks. It is a book about pleasure, about the great food you can have without spending loads of money or depleting the planet’s resources. Diana Henry shows you how to save money by cooking ahead, using up gluts from the garden, and how to cook with respect for sustainability and resources. Her delicious recipes originate from all over the world – from Sicily to the Sahara – and turn ‘going without’ on its head to make it a pleasure. 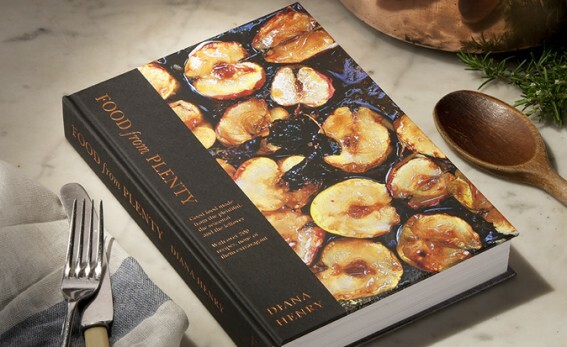 "Acclaimed food writer Diana Henry is a modern day Elizabeth David... An essential recipe book." "One of the most essential books you can have"
"Almost uniquely for a modern cookbook there are at least 20 recipes here that you want to try immediately." "I love Diana Henry's cooking and can thoroughly recommend Food from Plenty which features her characteristic blend of the everyday with the unusual." "A brilliant guide to shrewd food buying and making the most creative use of whatever we bring home."